Following a tip from the VX-8R Yahoo group I ordered a high capacity 2000mAh FNB-102Li battery for my VX-8GR from a dealer in Spain that was selling them for EUR 28.50. The website couldn't calculate shipping to the UK so I received an email asking me to order two connectors the cost of which equalled the cost of the shipping, making a total of EUR 36.80 - still much less than the price of the Yaesu product even when ordered from Hong Kong. After this was sorted out the battery was with me five days later. My pleasure at the speed of the shipping soon turned to dismay. Yaesu chose to make the VX-8 belt clip attach to the battery pack. 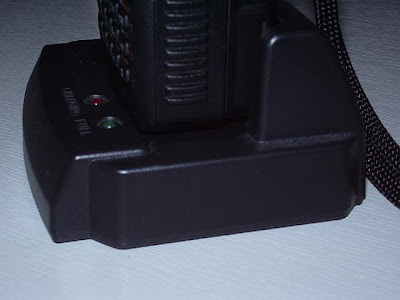 I don't know whether the accessory batteries bought from Yaesu come with a belt clip to attach to them but this one doesn't, so if I want to interchange this battery with the one that came with the radio one of them will have to be used without a belt clip. But worse was to come. The battery will not charge in the drop-in charger while it is attached to the radio! The charger has a platform which, as owners will know, is deeper than the radio with the stock battery - presumably to accommodate the thicker higher capacity version. But with this battery attached, the front of the radio fouls the lip at the front of the charger where the status LEDS are, preventing it from dropping the last tenth of an inch necessary for the battery contacts to make contact with those on the charger. Is this a general problem with the FNB-102Li and the VX-8GR (in other words, is the GR thicker than the DR and my charger doesn't allow for this?) or is it just this third-party battery that is thicker than the one from Yaesu and causing the problem? I'm having to take the battery off the radio to charge it, but that rather spoils the convenience of having the drop-in charger. My VX-8R and FNB-102LI work fine with my drop-in charger. I seem to be getting the impression from comments elsewhere that the VX-8GR is a bit thicker than the R or DR, so it may only be that model that has the problem.